I was looking for a new cookie recipe that would produce delicious cookies but without violating all health-food recommendations. Then I came across this recipe and thought I would give it a try. It sounded intriguing but I was also a bit skeptical. The dough was much thinner than any cookie dough that I had ever made. The baked cookies, however, were delicious and we have already made them several times. 1. Preheat oven to 375 Fahrenheit. Line a baking sheet with parchment paper. 2. In a medium bowl, combine the flour, baking powder, salt, and cinnamon. Set aside. In a large bowl with an electric mixer on medium speed, beat the butter and sugar until light and fluffy. Add the egg, applesauce, and vanilla extract. Gradually beat in the flour mixture. With a wooden spoon, stir in the oats, and nuts, if using. 3. Drop the dough by heaping teaspoonfuls onto the prepared baking sheet. Bake for 10 minutes, or until lightly browned. Make sure to not overbake the cookies. Note: Egg can be replaced to make vegan option. 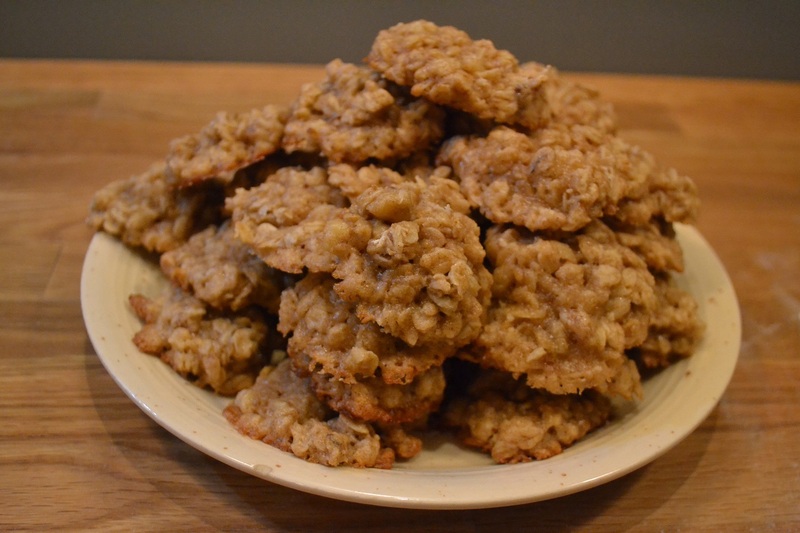 * Using applesauce keeps these cookies moist, but without all the added calories from butter. * Organic unsweetened applesauce also provides many of the benefits of raw apples, such as containing fiber and vitamin C.
* Oats are rich in vitamin B and E, iron, calcium, magnesium, and fiber. Categories: Cookies & Treats, In The Kitchen | Tags: applesauce, cookies, oatmeal, vegan, vegetarian | Permalink.